Hi Everyone, today's recipe is going to be Chipotle Chicken cakes! 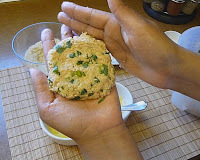 This smoky recipe is very versatile, and it's perfect for entertaining, it can be served as a main dish or as a delicious appetizer, or if you want something more substantial you can even make it into a Chicken burger with fries and everything! It's the perfect recipe to use any left over chicken and if you are entertaining, you can prepare these delicious cakes ahead of time and cook them whenever you are ready. They can be baked or fried, either way they are super tasty and super easy to make. 2-3 tablespoons fresh cilantro finely chopped. Note: I cooked the chicken in boiling salted water for about 15 minutes. To the water I added 2 bay leaves, 2 garlic cloves and a 1/4 of a small onion. You can cook the chicken any way you want. If you have left over chicken go ahead and use that instead. 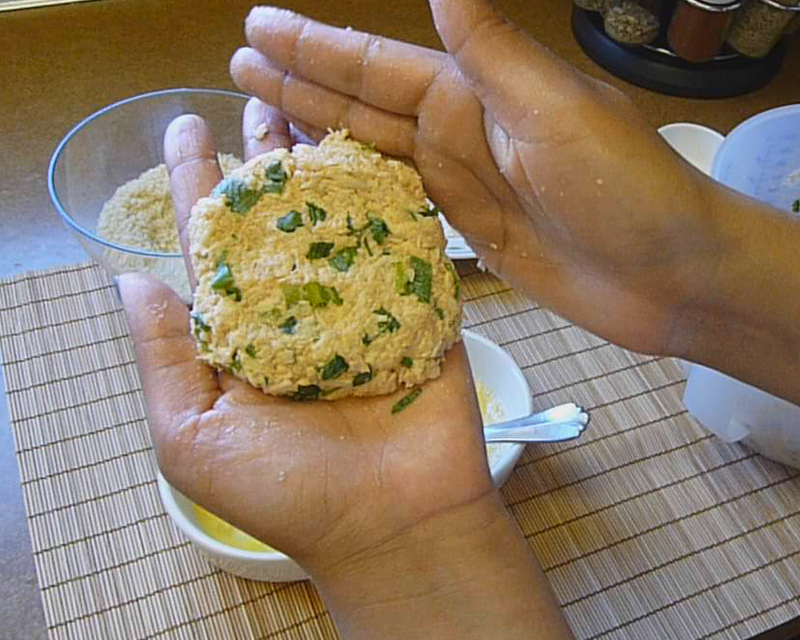 Mix together, and if the chicken mix feels too dry, add another tablespoon of Mayo, we want the chicken mix to be moist but not completely wet, we want the chicken mix to be able to hold together during the cooking process, if it is too dry, it will come apart on your pan. Beat the remaining egg with a little bit of water and set aside. Flour the cakes (cover in flour), dip them in the egg wash and then onto the Panko. Make sure every cake is completely covered with the flour, egg and finally the Panko. Keep on repeating this step until you are done. If you have time, I recommend to refrigerate this for about 10 minutes before cooking, just so the chicken can absorb all the flavors we just added to it. If you don't have time or if you don't want to, don't do it... the cakes will be just as good! Heat 4 tablespoons of vegetable oil and cook the cakes for about 3 minutes on each side or until golden brown. Drain on paper towels and you are ready to serve. Like I said this dish is very versatile. It can be served with rice, baked or refried beans, pasta, mash potatoes, corn on the cobb, salad, or anything else you can think of. You can even turn this cake into a burger!